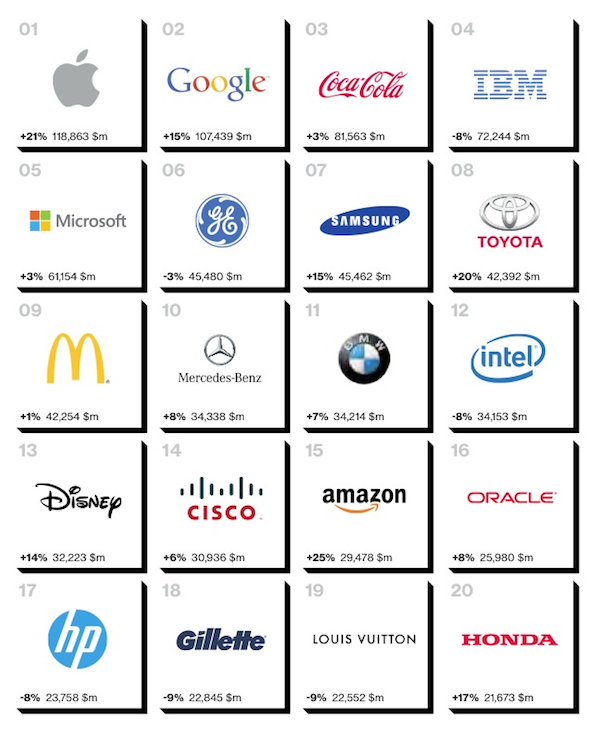 Apple and Google have become the first brands to surpass $US100 billion in value according to the Interbrand Best Global Brands list for 2014. Apple’s brand value rose 21% to $118,863 million and Google rose 15% to $107,439 million. Apple and Google came in at number one and two respectively for the second year in a row. 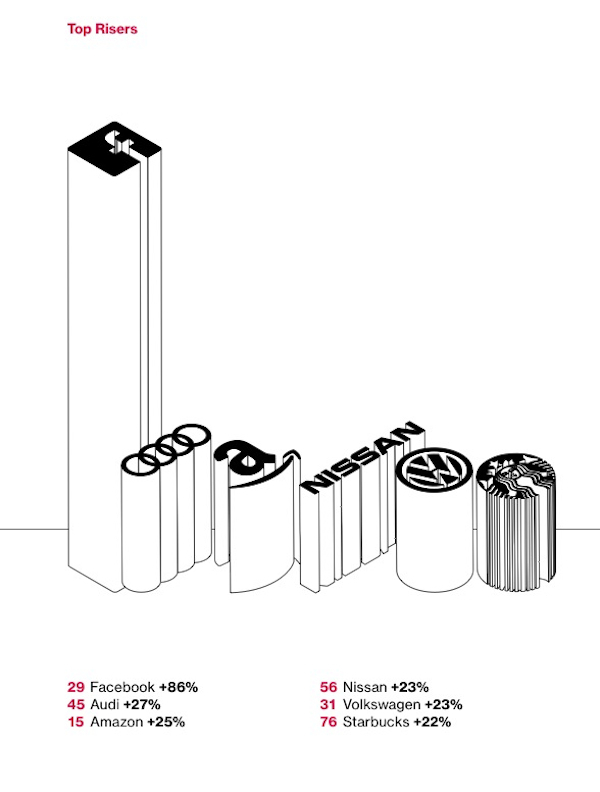 The top six brands retain their positions from the 2013 list, all having grown except IBM (down 8%) and GE (down 3%). After topping the list for 12 years running, Coca-Cola last year dropped from first to third place, which it has retained this year. Facebook grew strongly this year, increasing its brand value by 86% and jumping from 52nd position to 29th. Other fast movers included Amazon, up 25% to 15th, and three automotive brands: Audi, up 27% (to 45th) and Volkswagen and Nissan, both up 23%, to 31st and 56th respectively. Apple’s extensive product launches this year has helped the growth of its brand, including contactless payment system Apple Pay, Apple Watch wearable technology and two new iPhones including the larger-screened competitor to Samsung’s Galaxy Note. “With sensors everywhere and the brand’s consumer interactions deepening every day, it’s safe to say that Apple is not only ‘back’, but also boldly paving the way to the ‘age of you,” Interbrand’s report says. The brand is also strengthening by extending into new spaces: CarPlay integrates iPhone features for use while driving and HomeKit integrates home accessories. Apple’s recent collaboration with IBM will help the brand to penetrate the enterprise market by integrating big data and analytics with business apps for the iPhone and iPad. Interbrand sees Apple Pay as having “the potential to become the most powerful payment platform around”. Google has spent USD $17 billion over the last two years on expanding into a diverse range of fields including robotics, artificial intelligence, biotechnology, connected devices and wearable devices. “Google is aggressively pursuing a broad market agenda and, as it continues to grow beyond the billion users it currently serves, its strong brand position seems secure,” Interbrand’s report says. 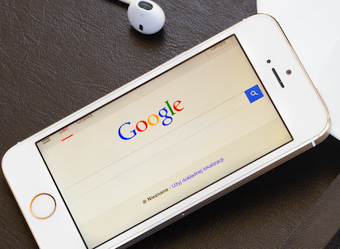 The brand’s track record of success in search, advertising, Android devices, apps and social network Google+ has laid the foundations for a strong brand, with these new endeavours set to strengthen Google’s name further. “Google ultimately seeks to gather more information about consumers so that it can deliver more personalized experiences. Google certainly has the capabilities and resources to deliver on its vision,” Interbrand says.